Tamales are, like all good things stuffed into other good things, long labors of love. This is not a quick and easy recipe. It requires some time in the kitchen. I make no apologies for that. But the result of your efforts are light, lovely packets of autumnal goodness that are a joy to eat and make use of two classic fall ingredients: pumpkins and turkey. Both, you should know, orginate in Mesoamerica. Yep. Both the Mayans and Aztecs domesticated the turkey, as well as the various winter squash we all know and love. 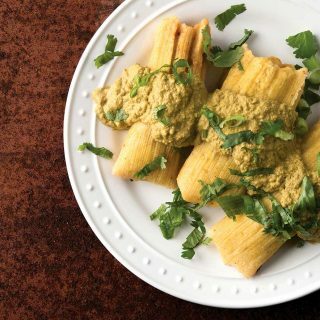 While not entirely pre-Contact, this recipe for turkey tamales is pretty close: Only a few spices, the lard and garlic were brought to Mexico by the Spaniards. 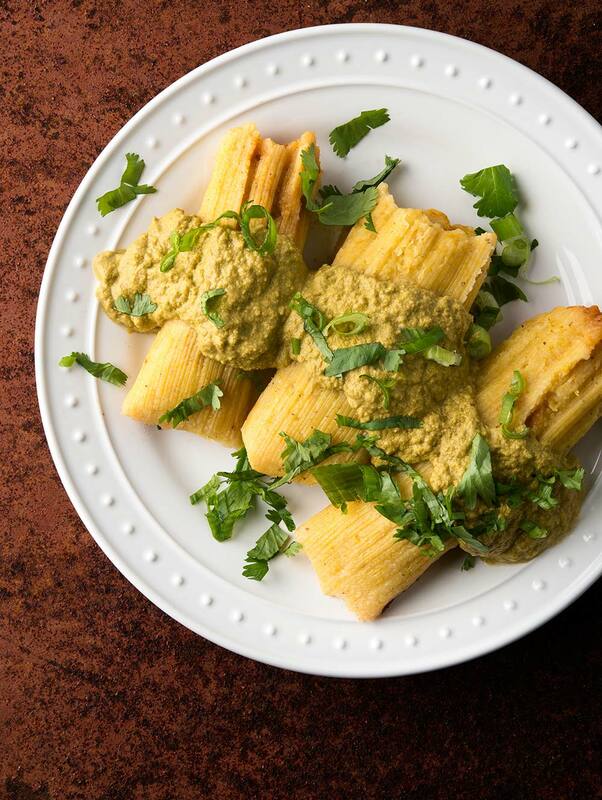 If you’ve somehow never eaten a tamal, which is what a single dumpling in a batch of tamales is called, they are ideally light packets of corn dough — the masa — filled with something good. In this case shredded turkey leg and thigh meat, coated in a red chile sauce. They are then steamed in corn husks or banana leaves or somesuch, unwrapped and eaten, sometimes with a sauce, and sometimes not. I happen to love pipian sauces, which are made primarily from pepitas, which are the green centers of pumpkin seeds. You can often find them in the health food section of your supermarket, or in any Latin market pretty much anywhere. If you can’t find them, you can use regular pumpkin seeds roasted, but be sure to grind them well, as they include a thin shell we normally eat. Sesame seeds are another authentic variation. And if you don’t feel like making the pipian, no biggie. The tamales are fine without them. Or you can use a different sauce. My tomatillo salsa verde is another good option. Since these require a bit of work, you can be more efficient by doubling this recipe. Most Mexican families that make tamales do it in an industrial scale — after all, making 75 tamales isn’t that much harder than making 25. Why bother? Tamales freeze really well. Premade tamales reheated (even microwaved!) then become fast food for busy nights. What’s not to love about that? Clearly this is something you will want to make on a weekend. 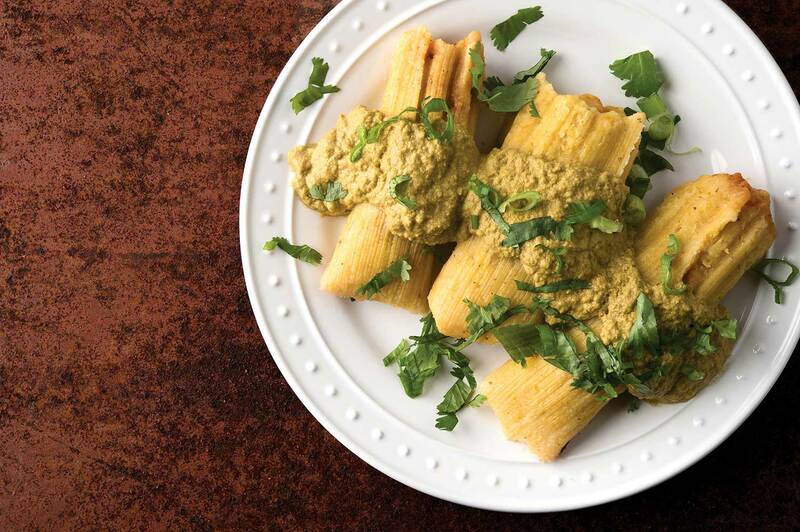 Making tamales is not quick and easy, although it isn't rocket science, either. A few tricks: The filling can be made several days in advance. The pipian sauce can also be made a day or two ahead, but not much more. Once made, the tamales store in the fridge for a week or so, and freeze well. To reheat refrigerated tamales, bring them out about 30 minutes before you eat them, and heat up a comal or skillet. Toast the tamales in their husks until the husks get mostly charred, then serve. This is arguably tastier than eating the tamales fresh. For frozen tamales, put them in a steamer frozen, and steam for about 20 minutes or so. Cook the pumpkin. Roast the pumpkin or squash at 350°F until it's soft, about 45 minutes to 1 hour. Scoop it out of the shell and puree in a blender. This step can be done a few days in advance. Soak the corn husks. Submerge the corn husks in hot water and let them soak until you need them, at least an hour or two. Prep the turkey. If you are using leftover turkey, shred it up and chop it a bit. Remember it's going into tamales, and you don't want all the meat to come out when you cut off a piece with your fork later. If you are using fresh turkey, simmer it in the rest of the turkey ingredients until it's tender, then shred. Keep the broth. Make the turkey sauce. While the turkey is simmering, make the sauce for it. Heat the lard in a pan and cook the garlic and onions over medium heat until they are translucent, about 5 minutes. Add the torn up chiles and cook a minute or two, then add the remaining sauce ingredients. Simmer gently for 45 minutes. Let the mixture cool a bit before pureeing in a blender. You want this sauce smooth. Mix with the shredded turkey. Make the pipian. After you're done blending the turkey sauce, rinse out the blender and pan. Wipe the pan down and add the next batch of lard, onions and garlic, and saute over medium heat until soft but not browned, about 4 minutes. Add the tomatoes and pepitas and cook, stirring often, another 2 or 3 minutes. Turn off the heat and let this cool. Add the contents of the pan to the blender along with the remaining pipian ingredients. Blend until smooth, adding 2 to 3 cups of broth or water to loosen. Make the tamale dough. In a large bowl, add the masa and 2 1/2 cups of pumpkin puree, along with the remaining ingredients and mix well. Add just enough hot water to make something between a batter and a dough: You will want to be able to spread it on the corn husks. Form the tamales. Take a corn husk out and place it in front of you narrow side down. Smear some dough over the center of the husk, leaving about 1/8 to 1/4 inch free on the edges. Place a heaping tablespoon of turkey filling in the center. Fold over the corn husk to seal the dough, then roll it a little to make a cylinder. Fold up the narrow end of the husk to to form a stable bottom to the tamal. You can either stack them in a steamer that way, or tie them off with strips of corn husk, or use twine. Cook the tamales. Set a steamer insert into a large pot. Pour in water to the level of the steamer, but not so much the husks get soaked. Line the steamer with spare husks and arrange the tamales open side up into the steamer. Cover the pot and steam for 1 hour. Check the level of the water in the pot and make sure it doesn't all boil away. To serve. Heat the pipian gently -- don't let it simmer or it might break. Unwrap some tamales and cover with the sauce. Garnish with cilantro. No turkey? Use any white meat. Pheasant, rabbit, pork or chicken are all good. Don't have the exact chiles? No biggie. Any combination of ancho, pasilla or guajillo are fine. And needless to say it doesn't have to be a pumpkin in the masa dough; any winter squash (except spaghetti squash) works fine. When looking for lard, you want the refrigerated stuff. If you don't see it at a Latin market, ask. Ditto for masa. Many Mexican markets will have freshly made masa in the back, and are happy to sell it to you. I know they’re traditional, but if we can’t find corn husks now in winter, any recommendations for substitutions? Wow, I was surprised that someone actually used the correct singular spelling for tamales! I bought your new book, by the way, but it looks like my wife is going to gift wrap it for Christmas. I can’t wait to start using some more of your recipes!